Avoid fruit with skin breaks, puncture or brownish discolouration. Also avoid immature fruit ­ ones that are relatively hard, poorly coloured and sometimes very shrivelled, as well as those that are excessively soft, leaking or decaying. Japanese plums (Shiro and Early Golden) will continue to ripen even if harvested at the mature green stage. 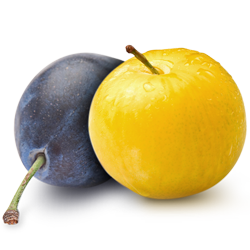 European blue plums and prunes will not continue to ripen after harvest. For best customer satisfaction ensure your prunes are mature at harvest. Plums should be well coloured for the particular variety. Select prunes that yield to gentle pressure. A reddish brown appearance around the pit indicates a normal ripening process. A slight shrivel around the stem end is normal. 1. Do not store tender fruit above 35 F (2 C); quickens ripening and can cause internal breakdown. 2. Avoid stacking baskets of fruit or rough handling. 3. Frequently cull displays for damaged fruit to prevent the spread of spoilage. 4. Ontario tender fruit is delicate, remember "the least amount of handling is best." 5. Pears produce and absorb odours [i.e. do not display or store near onions]. The Ontario tender fruit and grape industry has built its reputation by consistently supplying Canadian retailers with safe quality fruit. The Ontario Tender Fruit Producers' and the Ontario Fresh Grape Growers' Marketing Boards, in conjunction with the Canadian Horticultural Council have adopted the Canada GAP OFFS (On Farm Food Safety) program based on the seven basic principles of the internationally-recognized HACCP (Hazard Analysis and Critical Control Point) approach. For more information on the program please visit the CanadaGap website: www.canadagap.ca.